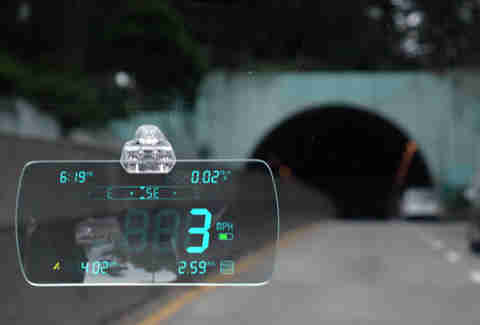 The head-up display (HUD) that you'll find in an ever-increasing number of cars traces its roots to fighter jets, where its value in projecting vital information on a screen within a pilot's line of sight can prove the difference between life and death when the situation requires constant awareness of a perpetually changing environment. You've surely heard about HUDs before, or even used one in a high-end car or truck. In modern vehicles, HUDs function by projecting information onto the windshield -- that only the driver can see clearly -- so eyes need not turn away from what lies ahead. Thanks to HUDs, we are moving toward driving without having to rely on your handheld smartphone for assistance of any sort. While we still have a way to go before you'll be able to truly set your phone and forget it, the current and future HUDs are a step in the right direction. While systems like Apple CarPlay and Android Auto seek to lessen the distractions caused by smartphones, they merely mitigate them by sending information to a centralized screen that isn't easily visible. HUDs, on the other hand, are so useful because they rely on the car's internal systems, then project the most important data -- whether that means a speedometer, navigation directions, and/or radio information -- directly to the driver's line of sight. Generally speaking, it's a reverse projection system that involves some glass and a little visual trickery to make the image appear. The process isn't entirely unlike how video-game machines used to work back in the days when Tilt was a thing. Most integrated HUDs that come as a factory option measure up to 7.5 diagonal inches or so -- splitting the difference between the screen size of an iPhone and an iPad. That doesn't translate to a particularly large windshield display. Information conveyed to the driver is obviously limited to what fits on the screen, so it's either a lot to take in -- in small type, no less -- or not a lot of information at all. The next frontier is all about size. Lexus has been at the forefront of gauge design since its inception, introducing the world to electroluminescent gauges with its very first car in 1989. A few weeks ago, Lexus introduced a big, new idea to solve the lack of HUD real estate on your windshield: a super-sized, 24in head-up display, which will debut as an option in the 2018 LS500 sedan. 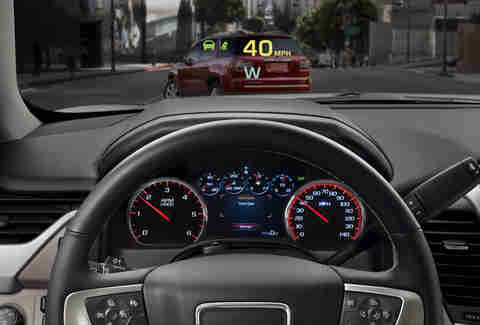 This is the first time that an automaker has boasted about the sheer size of its HUD, but it's unlikely to be the last. 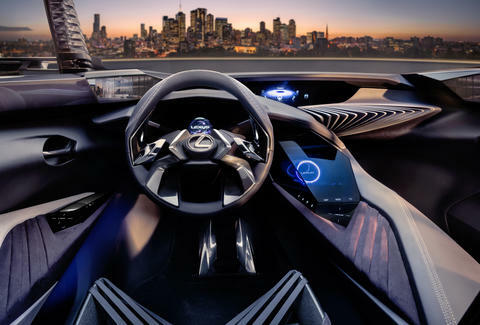 While details are still top-secret, the LS500 will have a configurable display of navigation directions, vehicle speed, and cruise control information, in addition to added safety feature integration like a pedestrian warning system. Because it stretches as wide as the instrument panel itself, it means we're nearing the day when there's no need for traditional instruments at all. 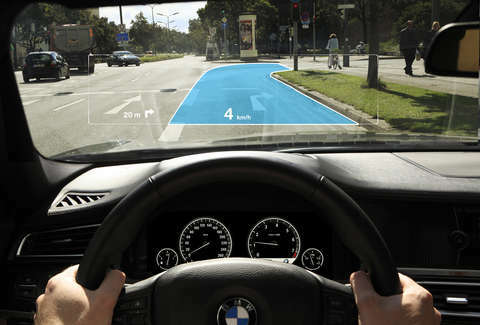 Also on the high end, BMW is planning to introduce augmented reality into its cars with HoloActive Touch. Strictly speaking it's not an HUD, but a series of holograms in the cabin with which you can interact. If you aren't in the market for a car in the premium or luxury segments, but you still want to enjoy the benefits of an HUD, you actually have quite a few options. Mazda offers a relatively rudimentary HUD in the Mazda3 sedan and hatchback as part of a $1,600 package. HUDs are also available on the MINI Cooper, Chevy Camaro, and Toyota Prius, but for now they remain a rarity for factory installations without crossing over into luxury territory. Luckily, there are some nifty add-on solutions that deliver the functionality of an HUD without requiring you to take out a new car loan. Take Navdy's HUD, for example: a $749 projection system that plugs into your car data port and displays relevant information on a pop-up screen. That price might seem steep, but Navdy's answer performs the same tasks of Apple CarPlay, in addition to performing HUD duty. At the lower end of the pricing scale, HUDWAY Glass ($49.95) offers a low-tech option that relies on your smartphone and sits atop the dashboard. Navigation pioneer Garmin has a similar idea for a bit more cash. These are stop-gap solutions at best, though. Such is the price you pay for not truly abandoning your smartphone. If you can hold off a short while, you're going to like what's coming next for HUDs. 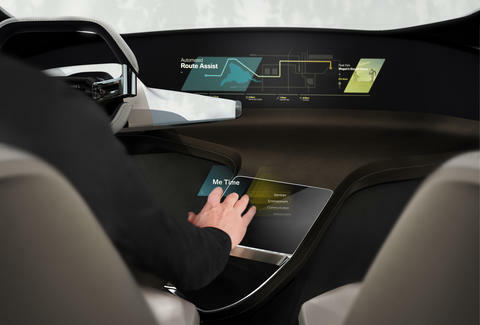 As technology improves and development costs are amortized, car companies are expected to pivot from tacked-on and integrated screens to full-on projections to the windshield -- or other neat ideas. Imagine being able to literally keep your eyes looking forward 100% of the time, and not being forced to turn your head down at all. 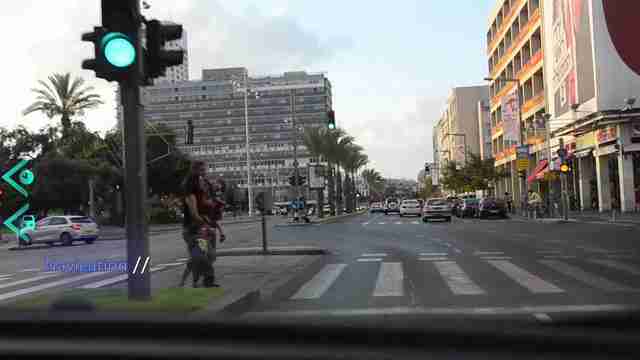 Half a decade ago, Israeli startup Mishor 3D came close to making this a reality, encouraging motorists to "drive like a pilot," using an HUD showing graphical projections of directions ahead. Need to be in another lane, for example? Rather than have to look down at a screen to check, you can look straight ahead, and the system highlights the designated lane for you. The tech was so solid that Ford was investigating a relationship with Mishor to license its technology as recently as two years ago before the deal evaporated. Regardless of the state of the company, its efforts weren't for nothing. More recently, Jaguar and Land Rover both teased something similar a couple of years ago, with the former offering up a "virtual windscreen" concept, a video-game-like experience that could even help you on a racetrack, and the latter using advanced HUD technology to create an "invisible windshield" that, in tandem with cameras mounted underneath the vehicle, could help you see what's immediately in front of you. With the capability of smartphones, these days, the driver's seat has become a center for unwanted distractions. In addition to taking in information about what your car is doing, you're now bombarded with phone calls, texts, Spotify options, and so many other apps demanding your time and focus. It's a narrative that sounds like a commercial from the hopeful 1950s, but screens in front of, to the side of, and in the hands of today's driver are now a burden for concentration. What's the solution? Your windshield is about to become very, very valuable real estate. Jeff Jablansky is a contributor to Thrillist Cars, and never looks down. Follow him @unclewithcars on your HUD.